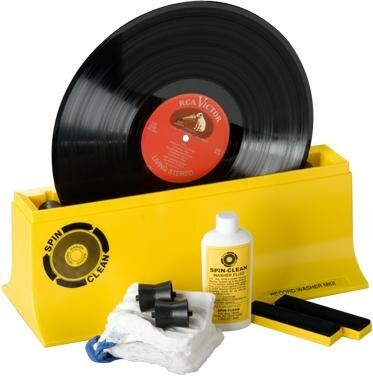 Spin Clean Record Washer MkII is a revolutionary product for anyone who's tried an awkward spray/brush type record cleaner and is convenient thanks to double sided cleaning in one motion - use to clean LPs or 78s. Using a record brush on your vinyl prior to playback is essential in preventing dust, but you'll only get the best sound from your vinyl following a wet clean, removing much more dust, dirt and allowing your stylus to properly navigate the grooves. When using a traditional cleaning spray/brush method, how can you tell that you're pushing hard enough or if you have enough liquid on your brush? Is it even removing smudges and fingerprints? With the Spin Clean record washing system, it's easy as one, two, three: fill it - spin it - dry it. You never have to adjust the brushes (they're pre-set at the right pressure). Note: The fluid used in the Record Washer System does not contain alcohol, so can be used to clean 78rpm records.